Update: Penn was not present during the interview. He met with El Chapo in Mexico, and they agreed to do the interview in the future, but circumstances prevented it. So Penn sent the questions by Blackberry Messenger and El Chapo filmed and sent his replies. 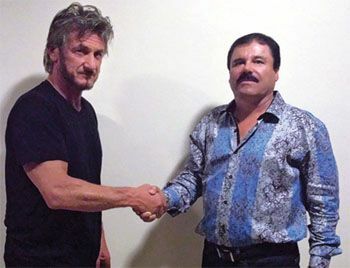 Rolling Stone has just published a two minute video clip from a recent video interview of Joaquin "El Chapo" Guzman by Sean Penn at a secret location. RS says the interview was submitted to El Chapo and he had no changes.